Ever since it was established in the country in 1997, Starbucks has always been known to brew handcrafted beverages for coffee lovers. Since 2012, however, the company has also been brewing opportunities for young Filipinos to better their lives through simply serving Hope in a Bottle. In partnership with Hope in a Bottle, Starbucks Philippines (Rustan Coffee Corporation) has been retailing the purified drinking water in their stores nationwide, to generate funds needed to build public school classrooms in areas where they are most needed. Upon construction, the facilities are donated to schools identified by the Department of Education Adopt-A-School program, to help address the problem of classroom shortage. The department is set to deliver 81,000 classrooms to address the shortage which affects more than 2.5million students. 100% of the profits from selling Hope in a Bottle go into building the classrooms. The social enterprise has built four classrooms for Starbucks, including one in H.N. Cahilsot Elementary School in General Santos City, and two classrooms at the Lt. C. Villafuerte Sr. Elementary School in Davao City. Recently, officials of both partners have unveiled another classroom donated by Starbucks at the Archbishop Emilio Cinense Memorial Integrated School (AECMIS) in San Felipe, City of San Fernando, Pampanga. “We would like to thank Starbucks for being a donor of our new classroom. This will benefit not only our students for this current schoolyear but also all the future generations of students here in San Felipe,” said Felisa Cabaobas, AECMIS principal. The principal noted that before HOPE and Starbucks donated the new classrooms, students from different grade levels shared old, poorly ventilated classrooms through a morning and afternoon “shifting” schedule. This meant that every day, teachers had less- time to teach their subjects while students had to learn as much as they can in the same amount of time, in such a poor learning environment. To be occupied by Grade 11 students, the Starbucks classroom is made of eco-bricks from a compact mixture of cement and post-consumer plastic, making it stronger than regular concrete hollow blocks. This is the program’s first classroom to be built with eco-bricks. HOPE considers the latest classroom construction a breakthrough in their advocacy since it addresses two main concerns: education and the environment. “Eco-bricks provided us with the unique opportunity to upcycle thousands of plastic bottles per classroom, so we have committed to using them in all of our builds starting 2018,” said Joie Ann BalaongHOPE program officer for education. More than building and donating classrooms in far-flung and devastated areas, Friends of Hope and Starbucks share in the vision and passion of making education more accessible to students, giving them hope for a brighter future. “We are happy to be partnered with HOPE. At Starbucks, we believe in making a difference in the communities we engage in. In this case, we believe that every Filipino has the right to quality education by providing them with a conducive learning environment, and this is what our partnership delivers,” said Jo-Ann Ramos, Starbucks Philippines marketing manager. In mid-2019, Starbucks is set to turn over its 5th classroom, which will also be constructed using eco-bricks, as part of its commitment to education and the environment, and is already looking forward to building more classrooms and being a vehicle for positive change among the youth. 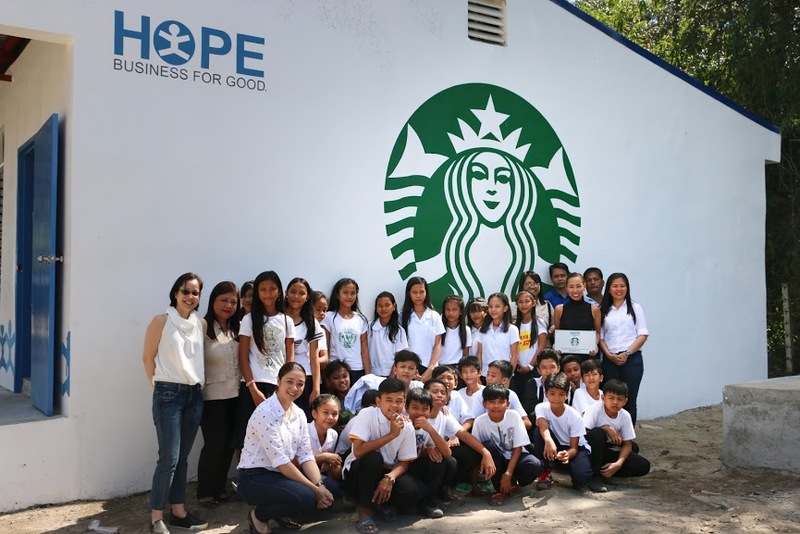 Apart from helping build new classrooms, Starbucks is also committed to refurbish and rehabilitate school facilities to solve classroom shortage through its partnership with non-profit organizations, Teach for the Philippines and Renovate to Educate. The program gives Starbucks partners (employees) the opportunity to help rebuild classroom chairs and tables, repair classroom doors, and repaint comfort rooms, even fabricate blackboards and shelves through various initiatives, including the Starbucks Planner promotion. To date, the Renovate to Educate program has rehabilitated fourteen (14) schools in Metro Manila, Laguna, Baguio, Cebu, Davao and Cagayan de Oro City with the help of more than 800 Starbucks partners.